(BPT) - Whether you plan to live in your home for years to come, or have an upcoming listing on your mind, now could be a great time to create an outdoor living space. Today more than ever, homeowners are seeking ways to maximize the footprint of their home - both inside the four walls and out. Outdoor environments can serve many purposes and are a perfect way to customize a space that is right for you. Whether you keep it simple with a built-in grill, some counter space and a sink, or go grand with a brick pizza oven and abundant seating at a granite-topped counter, an outdoor kitchen is becoming a must. In fact, according to Realtor.com, home buyers will pay a premium of more than 26 percent for a home with an outdoor kitchen. As with the indoor kitchen, many outdoor kitchens include a cooking area, sink, storage and refrigeration. As with your indoor kitchen, the faucet outsdie can be the perfect marriage of beauty and function. You can find a variety of kitchen faucets from manufacturers such as Danze that fulfill all your outdoor needs. Need the ability to put water exactly where you want it in your outdoor workspace? A pulldown faucet from Danze offers great looks and exceptional versatility. Many of the technology wonders you enjoy indoors are making their way into outdoor environments. From built-in flatscreen TVs that can stream video, to video gaming systems, Wi-Fi and surround sound, outdoor entertainment has gone high tech. Whenever you’re incorporating electronics and electricity in an outdoor environment, weather proofing and proper wiring are essential. Keep these critical aspects in mind while planning your outdoor space, and deciding what media you’ll incorporate and where it will be placed. Outdoor bars, like traditional tikki bars, may increase your home value by nearly 14 percent, according to Realtor.com. Whether you’re thinking of adding a bar in tandem with your outdoor kitchen space, or want to simply expand your entertaining area, an outdoor bar requires a few basic elements. A fully operational sink with a high-functioning bar faucet are a go-to when it comes to outdoor bars. Storage for beverages and glassware, a drink chiller, ice storage and seating can make your outdoor entertaining area an envy in the neighborhood. 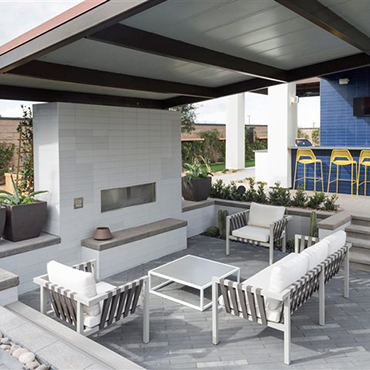 While plenty of comfortable, attractive seating tend to be a significant part of outdoor living spaces, modern outdoor spaces are re-defining relaxation and entertainment. In addition to seating and dining areas, homeowners are incorporating recreational elements such as ping pong and billiards tables, putting greens, hot tubs and infinity pools. Firepits and fireplaces are also popular for adding ambiance, and deliver the added bonus of extending the outdoor living season well into cooler months. Whether you choose to build a full-wall fireplace that doubles as a brick pizza oven, or stick with a more modest, portable firepit, adding heat and comfort to your outdoor space can also add value (upwards of 21 percent according to Realtor.com). Outdoor living spaces offer a multitude of benefits and creative options. Even the simplest of designs can make a home feel larger, increase the property's resale value and bring years of enjoyment.